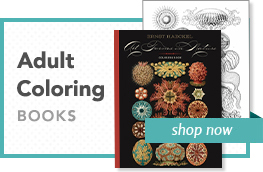 Published with Chester Beatty Library, Dublin, Ireland. This notecard folio presents the two halves of a double-page painting from a manuscript in the Chester Beatty Library, Dublin, Ireland, that was produced in 1579 for the Ottoman sultan Murad III (r. 1574–95). It is a history of Murad’s grandfather, Suleyman I. 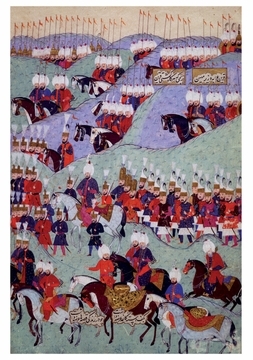 The Ottoman Empire was one of the greatest empires known to history. Ottoman rule began in Turkey in the late 13th century and extended until 1922, the year prior to the establishment of the Republic of Turkey. Although there were many great Ottoman sultans, none was greater than Suleyman. Known in the West as the Magnificent and in the East as Qanuni, the Lawgiver, he ruled from 1520 to 1566, longer than any other Ottoman sultan. His vast empire included not only Turkey itself but lands stretching westwards through North Africa as far as Algeria, southwards to the Islamic Holy Places of Mecca and Medina, and northwards into Europe to include most of Hungary. He died in 1566, while on campaign and the night before an Ottoman victory over the Hungarian army at the Battle of Szigetvár. 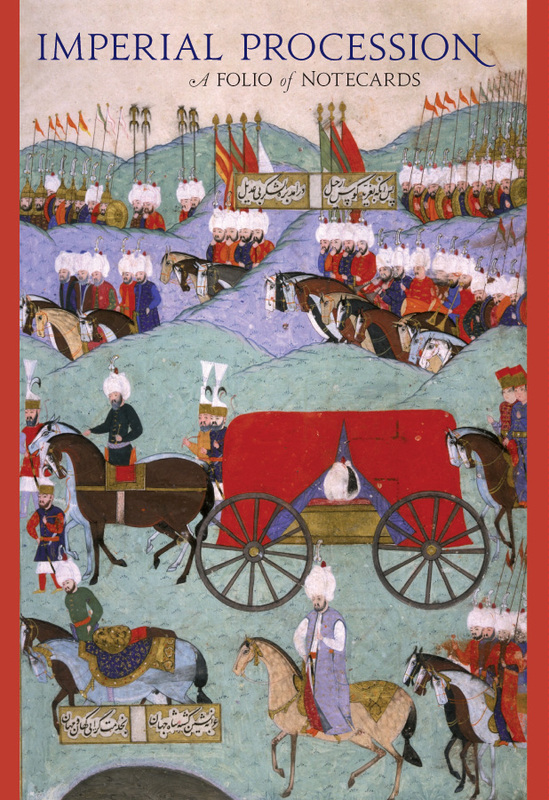 The double-page painting reproduced on these cards depicts the return of the sultan’s body to Istanbul following his death at Szigetvár, Hungary. 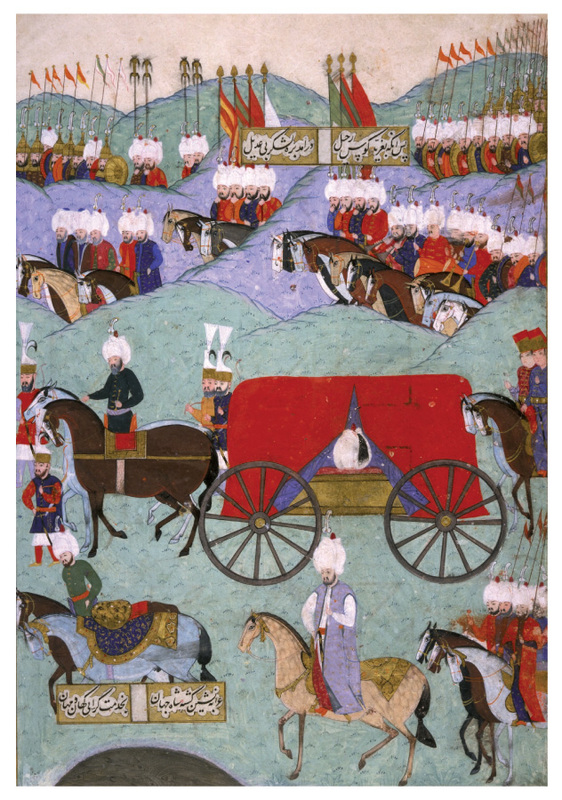 In the left half of the painting, some soldiers walk, others are mounted as they accompany their beloved sultan home one last time. The artist’s dense arrangement of serried rows of figures emerging from behind the hills creates the impression of an army of immense size—a never-ending wave of grieving figures overwhelming the countryside they pass through. In the right half of the painting, a carriage carries the body of the deceased sultan, and through the open curtain his turban, set carefully on the coffin, can be glimpsed. Throughout the composition, the artist has used a striking palette of mainly red, blue, and pale green, all offset by the dazzling white of the figures’ turbans and the dark tones of the horses. 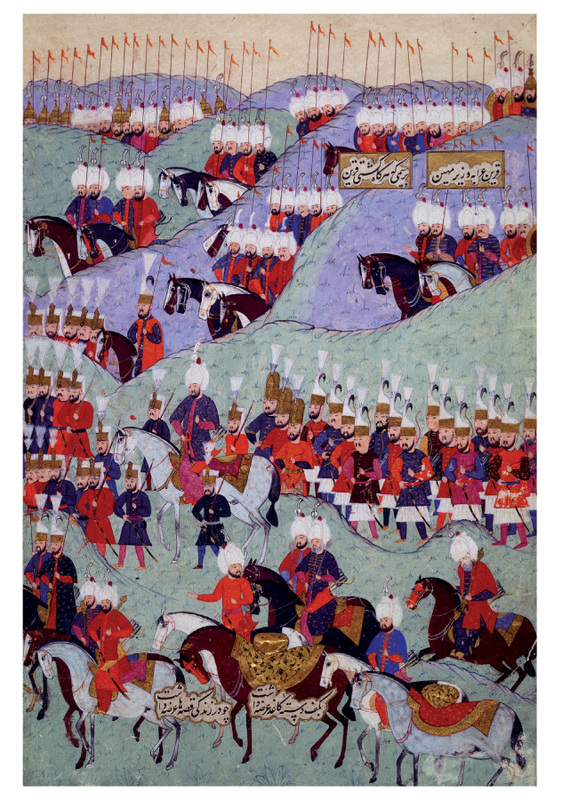 Contains five each of the two halves of an illustration from the History of Sultan Suleyman, 1579, Istanbul, Turkey.